Trying to find the town of Boyeux-Saint-Jérôme is difficult. Trying to find one of the hamlets surrounding the town is even more difficult, especially when you try to do it at night while climbing narrow, snow-lined routes with no street lights. When you go there for the second time, it is no easier. On that occasion there was a bit of light left in the February sky, and I figured if I simply asked someone in any of the hamlets where Domaine Rondeau was, they would easily direct me. The first problem was finding someone on the streets of any of the hamlets. The second problem was finding someone who knew the Rondeau name. I couldn't believe it! 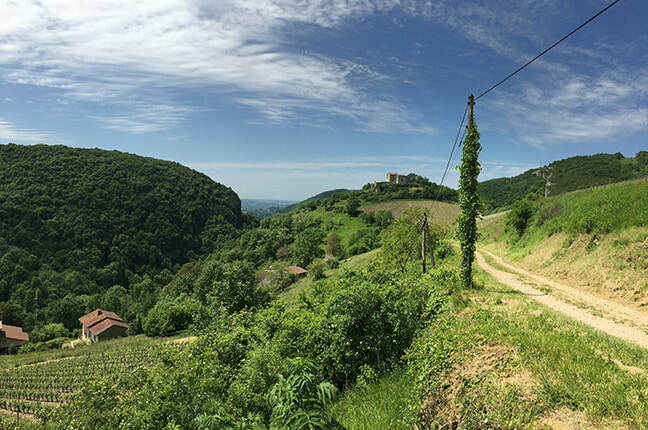 Tiny hamlets, Rondeau — one of the best Cerdon producers — how hard could it be to locate him? I asked several townfolk — kids even. Nobody knew who Rondeau was. After asking about the sixth person, I was led to the lowest hamlet on the hillside where I finally found the humble Rondeau home/winery. Marjorie and Bernard met in Bordeaux at university, where both were studying enology. 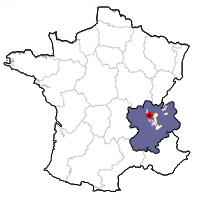 Marjorie had grown up in Boyeux while Bernard, a native of the Loire, had grown up near Saumur. Marjorie's parents grew grapes, and produced small amounts of Cerdon, the eclectic local wine. Pink, sweet and with bubbles, it is indeed one of the more curious wines of France. After the Rondeaus were married, they moved to Marjorie's property and began working with her parents. Shortly afterward they rewrote the financial structure of the domaine and renamed it Domaine Bernard et Marjorie Rondeau. 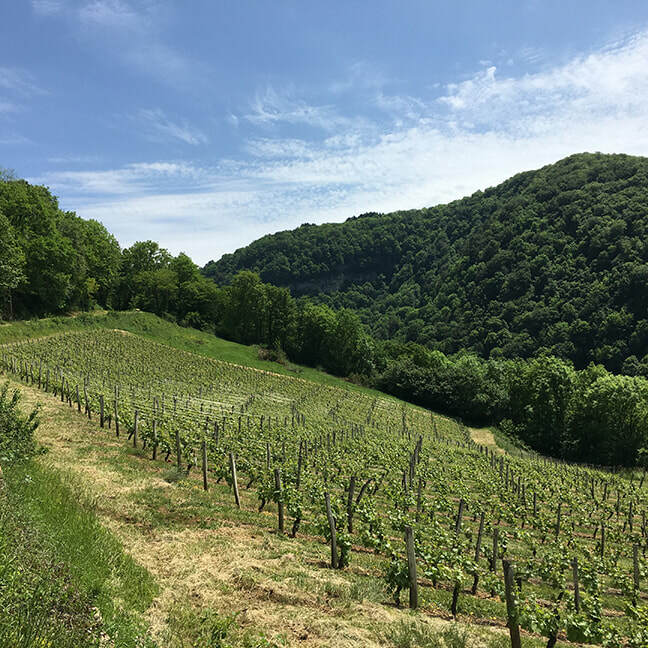 ​In retrospect, the reason that I had such difficulty in finding the domaine in such a small place is because the older locals were unfamiliar with the Rondeau name — it certainly would have helped to know Marjorie's maiden name. Hell, in the backwoods of France, someone from 300 miles away may as well have come from Mars. Right away, the Rondeaus began investing in new equipment for the chai: temperature-controlled tanks, automated descorgers, pressurized bottling machines, etc. 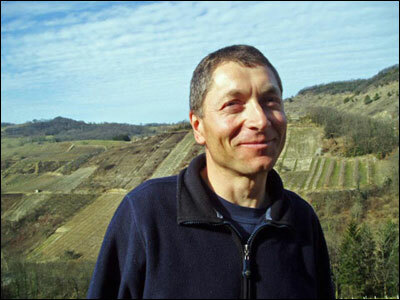 All of the equipment had been completely overhauled by the year 2002, and the new wines coming out of the domaine under Bernard et Marjorie Rondeau's name began delighting both consumers and journalists alike. Cerdon de Bugey, like most rosé wine, is best consumed in its first year of release. It is not a wine that one lays down. It is during this first year that all its aromas are present in their most flattering and enjoyable forms, including strawberry, cherry, cream and a hint of spice. Honestly, this is literally like a strawberry parfait in a glass. At about 40 grams of residual sugar, the wine does have some perceptible sweetness; however, with the very delicate tannin of Gamay and the supporting acidity, the wine comes across as being less sweet than it actually is. Tasting notes: Cerdon is absolutely delightful as an aperitif. Better yet, it can serve as a wonderful accompaniment to fruit-based desserts, beignets with powdered sugar, or chocolate-based sweets. 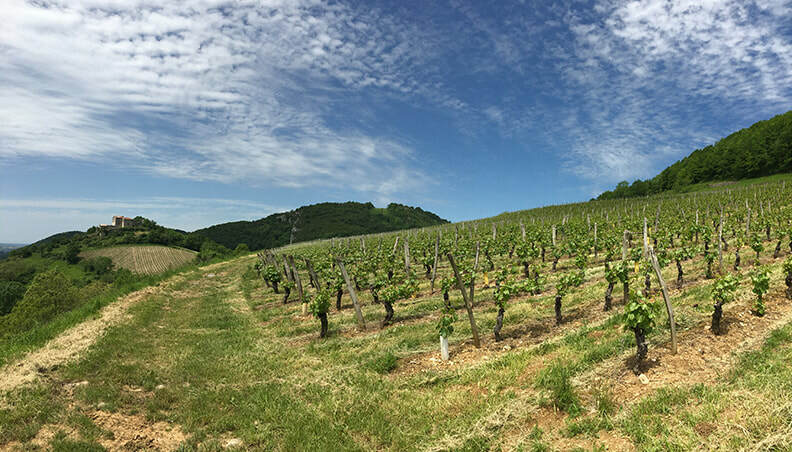 ​So Cerdon de Bugey is sparkling, but how does it differ from other sparkling wines? In short, Cerdon is relatively sweet and is always pink. Its white wine world equivalents are perhaps Clairette de Die or Moscato d'Asti. Its red comparisons are perhaps Brachetto d'Acqui or Lambrusco. Cerdon, however, is normally made with either pure Gamay or a combination of Gamay and Poulsard grapes. At Domaine Rondeau, the Cerdon is made with 100% Gamay, harvested by hand at optimum maturity. The grapes are brought to the winery, where the juice is extracted with a pneumatic press and led into stainless steel tanks. It is cooled briefly and the temperature is allowed to rise. The yeasts carried on the skins interact with the sugar of the grapes and fermentation begins. 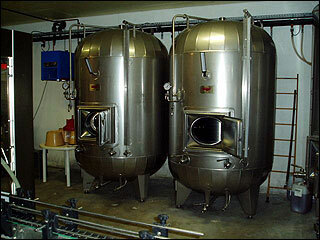 When the alcohol has reached about 7%, the tanks are cooled and fermentation is blocked. The wine passes through a light filtration that eliminates the large sediment and some of the yeasts, but quite a bit of residual sugar remains. The wine is bottled, and bottles are stored vertically in metal cages. While the bottles are dormant, the yeast that has not been filtered out continues to interact with the sugar and create carbonic gas within the bottle. This is called the prise de mousse and, like in Champagne, will naturally cause the wine to have bubbles. The wine gains some further complexity as it ages (for a few weeks anyway). It is then discourged (like in Champagne, the yeast and sediment are ejected), a cork replaces the crown capsule, the label is attached and the wine is ready for to be sold and appreciated.